Most application development and delivery (AD&D) teams are stuck guessing about what their users need, relying on internal experts to guide their decisions. This approach to development is no longer sufficient to keep up with changing user preferences or the growing complexity of production environments. 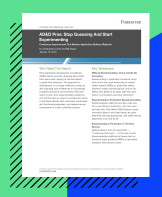 This Forrester report, published in January 2019, highlights experimentation platforms that enable developments teams to test ideas directly with customers, experiment with functional parameters, and release new service components in a safe and controlled manner.